Disability Resource Association (DRA) assures that no person shall, as provided by Federal and State civil rights laws, be excluded from participation in, be denied the benefits of, or be subjected to discrimination under any program or activity. 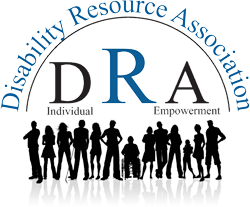 Disability Resource Association (DRA) further ensures every effort will be made to ensure non-discrimination in all programs and activities, whether those programs and activities are federally funded or not. Disability Resource Association (DRA) operates its programs and services without regard to race, color, or national origin, in accordance with Title VI of the Civil Rights Act of 1964. If you believe you have been discriminated against on the basis of race, color, or national origin by Disability Resource Association (DRA) you may file a Title VI complaint within180 days from the date of the alleged incident. The individual may submit a personally written complaint or utilize DRA's Title VI Complaint Form to Disability Resource Association's Executive Director. The Title VI Complaint form is published in English here on our website. However, DRA will translate any documents as needed and will accept personally written complaints in language of origin. For more information on the DRA Title VI program, and the procedures to file a complaint, contact the DRA Executive Director at 636-931-7696; or visit our administrative office at 130 Brandon Wallace Way, Festus MO.63028. In addition to utilizing the civil rights complaint process through Disability Resource Association, complaints may also be filed directly with the Federal Transit Administration (FTA), Office of Civil Rights, 901 Locust St # 404, Kansas City, MO 64106.